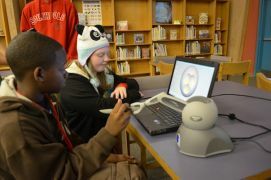 We have been talking a lot about Weatherstone Elementary recently, but there's something about the teachers' and students' enthusiasm about 3D that is difficult to ignore. 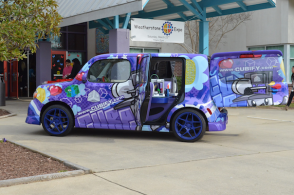 Last weekend, 3D Systems Geomagic attended a STEM Expo at the school in Cary, N.C., not just with our usual repertoire of 3D toys and gadgets but this time with the Cube Car. 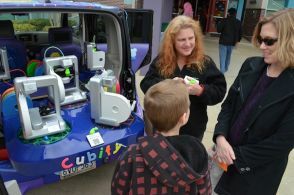 The Cube Car is a Nissan Cube, with five Cube 3D printers installed. It was the brainchild of the marketing team at 3D Systems last year, when they launched the Cube 3D printer and drove the car from California to New York, visiting locations and blogging about it on the way. The car is brightly painted on the outside, advertising Cubify.com, the web site where easy-to-use apps for 3D printing can be located. The front grill and some rear and side panels are 3D printed in intricate patterns that remind me of trees. The Cube printers inside easily slide in and out - an asset that only came clear to me when I started set up. I'll get to that in a moment. Now, I'm British by birth and culture, and even though I have been in the United States for 17 years, the English stiff upper lip never really leaves me. Brits are often terrified of being seen as undignified, thus our incessant tea drinking with our little fingers held out, and our insistence on referring to cookies as "biscuits." (Hey, no one's perfect.) So the appearance of the car struck me as"So American" at first: somewhat vulgar and surely beneath my dignity. (Pause as I drink more tea, with milk, from a small bone china teacup.) Then, horror! Cecilia asked me to drive it to the school for the event. Oddly, as I drove from the office to the school, people were smiling and waving, yes laughing even, and yet I was surprised to find I didn't feel one shred of shame. The Cube Car was already growing on me. Little did I know that I was about to completely fall in love. The 3D printers inside set up fast. With the back seats taken out, the entire back area has been converted into a 3D printing center. Five Cube 3D printers are bolted onto the top of three molded plastic sliding drawers: one on each side coming out of the back doors and three on a larger slider that comes out of the trunk. The electrical panel, battery and inverter are under this installation, accessible through a lift-out panel. Turn on the power switches and voila!, the printers are powered up and waiting. Put glue on the plates (where the print is created), check the materials are properly installed, use the touch panel to choose your model and off you go. Barring a technical hitch with one printer, we had successfully started my part of the STEM event, followed by four hours of talking to hundreds of parents, teachers and students as they thoroughly geeked out over what they saw and learned. 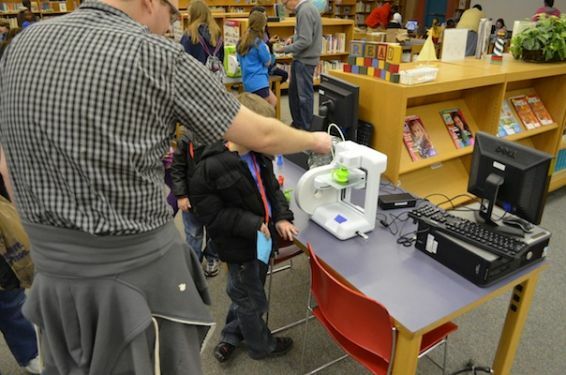 In the library, the rest of the 3D Systems Geomagic team were being mobbed by the crowd as they scanned faces, allowed kids to try out the haptic-based sculpting software and they demonstrated even more 3D printing. While I hosted the car over that 4-hour stretch, also mobbed by the crowd, I was becoming proud. 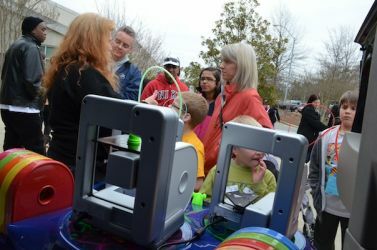 The excitement on the faces of everyone as they started to understand and personally experience 3D printing was electrifying. The Cube Car had worked its magic, not just on me but on hundreds of people as we got to show them 3D prints and actual 3D printing just by opening the back of the car. I was in love! We not only have the coolest technology in the world, from 3D capture, modify, sculpt and out to 3D print, but we get to show it off using amazing tools such as the Cube Car. Indeed, when my English"friends" (so-called) on Twitter that night teased and abused me about driving the car, I was ready to defend everything about it. From a fear of being common, perhaps embarrassed, I had gone to being a believer.